Yonezawa hot spring "hot water of peace"
The new source operates, too, and the freshness is good, too! Large communal bath and open-air bath of 100% of self sources natural hot spring flowing constantly from the source. You can enjoy sauna in large communal bath, too. We use flowers of sulphur ball of Tamakawa, Akita hot spring. There are 60-tatami-mat large hall and rest station with hearth, restaurant, too. In addition, we prepare cut salon and massage toko. 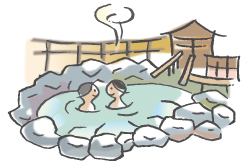 ■Name Yonezawa hot spring "hot water of peace"
Please confirm from facility homepage.